Voices of solidarity for the imprisoned bloggers and journalists were mobilized recently to honor the unfortunate 100-day milestone, so I thought I'd add mine, regardless of its limited reach. I've been impressed with the recent public outcry beyond Ethiopia's borders. 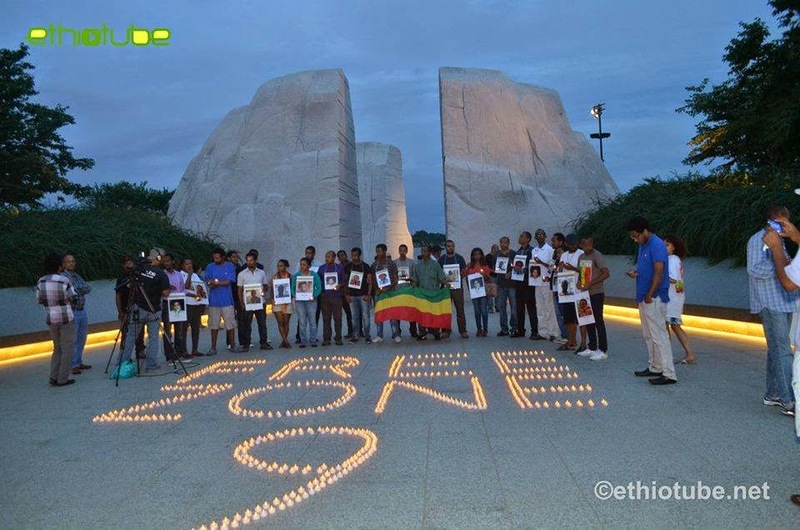 A global twitter campaign was coordinated on July 31 using the hashtag #FreeZone9Bloggers, and then on Saturday a vigil took place in Washington DC in front of the Martin Luther King Jr. Memorial, where members of the Ethiopian diaspora lit 900 candles to recognize the 900 days spent collectively in detention by the "Zone9ers." Obviously, the name of the group appeared often in these tweets, sometimes as above—ዞን 9 (Zone 9)—and sometimes with the number spelled out—ዞን ዘጠኝ (Zone ZeTheng). Words like these that I am getting to know by sight help anchor me. 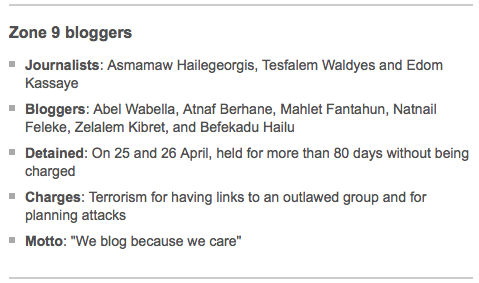 The names of the bloggers also appeared often; Befekadu Hailu and Mahlet Fantahun are mentioned in the tweet above. Plus, I learned some vocabulary related to the legal system. For instance, ፍርድ ቤት (firdih bayt) means "judgment house" (i.e., courthouse) and ችሎት (chilot) means "assembly" or "court proceeding." Interestingly, Lulit had never seen the word ጦማርያን (Tomariyan) before, which she thought meant something like "members." I suppose Amharic continues to evolve in Ethiopia. So the exercise continues to yield some linguistic benefit in that the story is helping me learn vocabulary around a theme. The word ነፃነት (netsanet), meaning freedom, shows up a lot, not surprisingly. And I learned from Lulit that her sister-in-law's ex-husband has the phrase ነፃነት ወይም ሞት ("freedom or death") tattooed on his body. 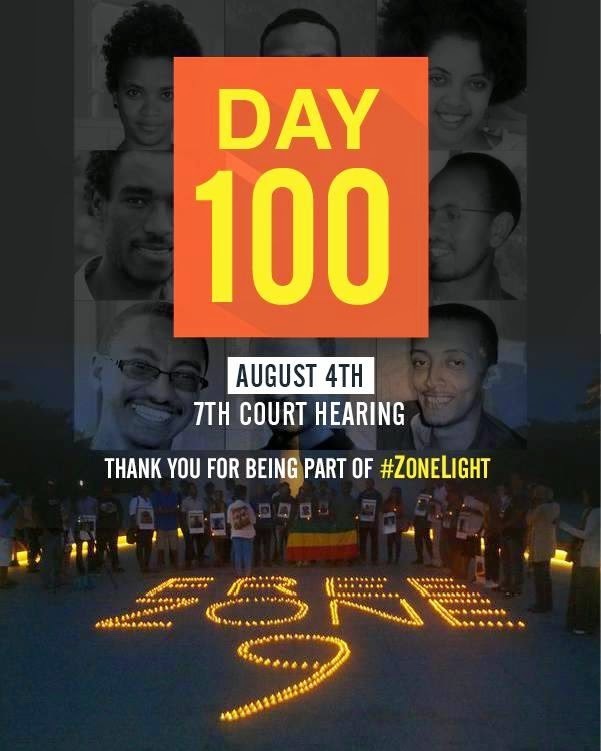 But following the story has also made me cynical about Ethiopia's civil society. I learned, for instance, that Ethiopia is the second worst jailer of journalists in Africa after Eritrea, according to Freedom House. Likewise, on the Freedom House's Map of Press Freedom (0=Best, 100=Worst), Ethiopia has the second worst Press Freedom Score (81) in Africa after Eritrea (94). Reporters Without Borders is slightly kinder to Ethiopia, ranking it #143 out of 180 countries on its 2014 World Press Freedom Index, just ahead of Cambodia and Myanmar. It puts Eritrea dead last at #180. Despite the lack of political freedom, a proverbial prison is still better than an actual prison, and I hope the innocent bloggers and journalists, along with all political prisoners, are released in the very near future. This blog post is dedicated to them.